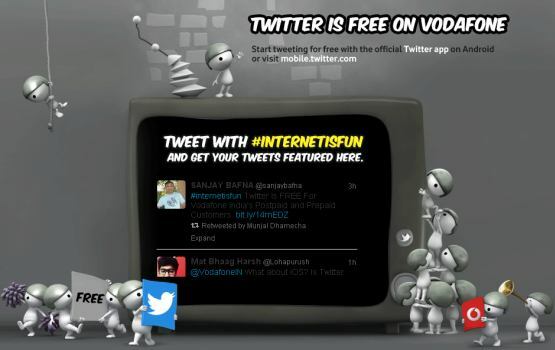 Twitter is now going for free for all the users of vodaphone. This offer is announced by Vodafone today that they are offering free twitter access to all its customer. The offer is applicable till 1st November of this year. The user has to first register there mobile and enable there vodaphone number to get access of the Twitter. It can only be accessible with Official Twitter app or Twitter's mobile website (i.e mobile.twitter.com) for free. Kindly note that no any third party software can be used for availing the free subscription offer, however standard data charges will apply upon clicking on external links. Earlier this type of tie-up has benn seen with Rcom. and recently Aircel also announced for free access to wikipedia.com. So just grab this offers. For vodafone users who are using "Portalnms", they have to change the APN with 'www' to avail this free offer, else they might be charged. Due to some reason it is not working with some blackberry mobiles, Hope it will be overcome within some time.